St Aloysius College, Mangaluru, is a hub of innovation in and around the area. Here are some of the innovations that have made Aloysians across the world proud. Did you know that we have our very own species of frog - named after the college? The Euphlyctis Aloysii. 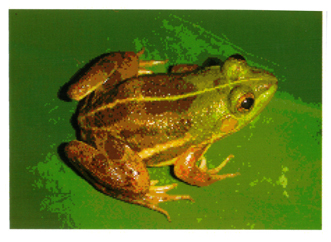 It is a tiny water frog with a mixture of dark brown and green colour found in the rivh biodiverse region of the Western Ghats. Dr Hareesh Joshy, professor and Head, Department of Zoology at St Aloysius College (Autonomous) Mangalore, and Prof. Mitusuru Kuramoto, Emeritus Professor, Fukuoka University, Japan are responsible for the find. Dr. Smitha Hegde has launched a website www.rondanobiodiversity.com on “Fern Biodiversity” in collaboration with M.Sc. Bioinformatics Department, AIMIT, Beeri. A MoU was signed by Dr. Smitha Hegde with Karnataka Forest Department to conduct a study and the collection of ferns of the Kudremukh National Park. Dr. Smitha Hegde and Sudha Sajeev (2013) compiled a Field Guide ‘The Ferns of Kudremukh National Park’, funded by the Government of Karnataka, Karnataka Forest Department, Kudremukh Wildlife Division, Karkala. Students of Zoology Department undertook projects in studying the biodiversity of fish, earthworms, insects and birds of Dakshina Kannada District. Laboratory of Applied Biology: It is a Research Centre, actively engaged in research programmes in plant tissue culture and molecular biology areas, imparting hands on training to the students and the staff of various institutions and exposing them to research fields. PG Dept of Biotechnology: It is a recognized Research Centre in Biotechnology with Three Research Guides and 15 students, in areas relating to Biochemistry, Plant Tissue Culture, Immunology, Animal Cell Culture and related areas. Research Centre under Tumkur University: St Aloysius Advanced Research Centre is recognized as Research Centre in discipline of Kannada, Bio-Science, Chemistry, English, Economics, Commerce, Management, with 11 staff members as Research Guides, guiding 53 students.